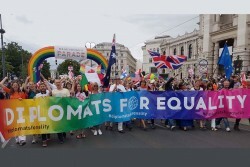 The 20th Rainbow Parade on Vienna’s Ringstrasse (20.6.) and the Vienna Pride (16.-21.6.) with the Pride Village on City Hall Square will set a sign for tolerance and equality.